Casa Valdez Studios: Triad Pairs Redeemed! When I hear players (including myself) using triad pairs I usually find myself cringing. In theory it is an interesting technique that generates lines that are neither horizontal nor vertical. The bi-tonal effect can be pretty cool as well. 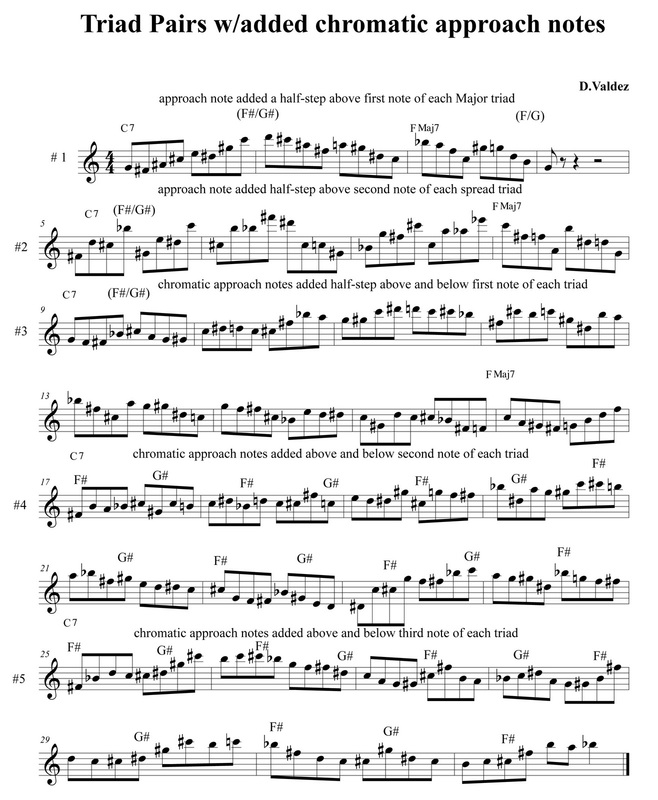 I've worked out of both Gary Cambell's Triad Pairs for Jazz and Bergonzi's Hexatonic books and was pretty excited about the possibilities, at least at first. I soon realized that this technique usually sounds too much like a simple formula, which is of course exactly what it is. 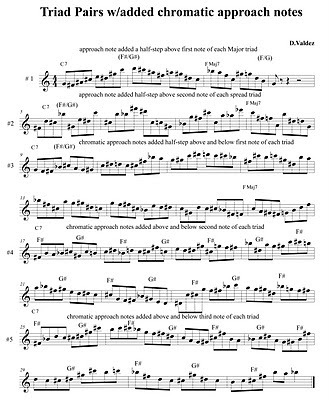 I even get bugged sometimes when I hear great players like Weiskopf or Bergonizi use Triad Pairs too blatantly. This last technique can really obscure the fact that you are using a formula to construct your lines. You can add simple single note chromatic approachs (like exercise #1) or fancy-pants multi-note Bebop enclosures. Since the Triad Pair/Hexatonic formula is a simple one to execute adding some chromatic approaches to it isn't a huge stretch. Below are some examples I wrote to illustrate how chromatic approaches can make Triad Pair lines a little hipper sounding. I've kept the patterns fairly simple for illustration purposes, so some of these still sound a bit formulaic. If you really mix all of these techniques together you can create some truly organic sounding lines. That's why I prefer pentatonics. Those get old about 5 seconds after Triad Pairs do. I like these exercises David. The chromatic approach breaks things up nicely while still maintaining the specific color that the triad provides over changes. Thanks Allen. Chromaticism makes everything sound better! I got Steve Neff's triad pair lesson applying them to standards (2-5 motion, etc.) He avoided the overly formulaic sound by concentrating on developing melodic form in his examples. He didn't stick to 2, 3, 4, or whatever number of notes per triad before switching to the other. It was to me, basically, like using them as hexatonic pitch collections. Very cool stuff. Thanks for these examples. Have you checked out www.noteflight.com? It could be a great way to emded playable scores in your blog. No affiliation, I'm just a happy user of the application. This is a very interesting concept used in jazz improvisation. I have not used these techniques very much though but it seems as if it is becoming more and more popular. These exercises sound awesome! I do not object to hearing patterns in a line. I like it as long as it is not the only ingredient in your solo. I don't think I would enjoy completely random streams of eight notes for more than 7.4 seconds either. I had a teacher - maybe 20 years ago - who showed me a great (interesting) system which combined triad pairs. He had basically worked out all the shapes and put them together, the simple rule being 'no two notes can be repeated'. Maybe I should print it up on my blog, with examples. Anyhow here's how it basically worked. C/B, C/Bm, C/B°, but C/B+ does not work as there is a G in both chords. You then continue chromatically down with all the combinations. Ex : C/Bb, C/Bbm etc. Eventually you start again with Cm/B etc. If you want more information drop me an email, but I think I explained it well enough ...... hopefully. Whoops, I forgot to say keep up the great blog.